Aam Aadmi Party has put up a series of hoardings in the capital for MCD polls. New Delhi: Upping the ante against Delhi BJP ahead of MCD polls, AAP has put up a series of hoardings in the national capital asking the voters to make a "conscious decision" between the two political parties. 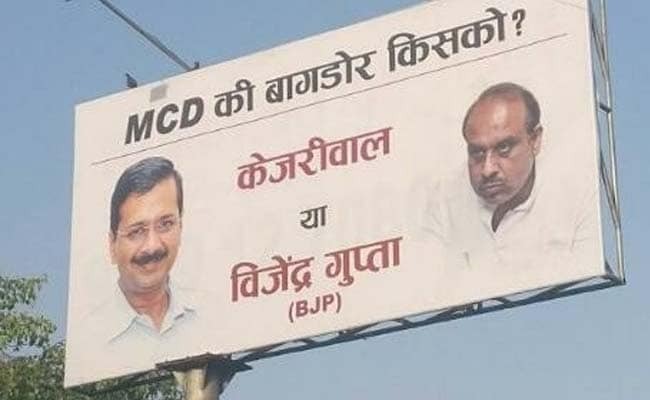 Aam Aadmi Party (AAP), which has put up a series of hoardings in the capital, has asked the voters to make a choice whether they want the "same old kind" of MCD governance which BJP leader Vijendra Gupta represents or the "Arvind Kejriwal model" of clean governance. The hoardings read: "Reins of MCD to whom: Kejriwal or Vijendra Gupta." Speaking on the issue, AAP's Delhi in-charge Ashish Talwar said, "The voters of Delhi know who to trust. They trust Arvind Kejriwal who kept his word on electricity and water and will keep his word on abolishing house tax, making Delhi garbage-free and MCD corruption free." "Do they (voters) want freedom from house tax or do they want the same old corrupt house tax regime in which even the process of paying for House Tax is mired in corruption? Do they want increased rates of electricity and water when a non-AAP MCD takes over both departments? "Do they want to give governance of MCD back to a party which for 10 years made Delhi synonymous with garbage? AAP is fighting this election on 20 years of BJP-Congress type of MCD governance which has led to bad primary schools and lousy hospitals," a release from the party said. Commenting on the developments, Gupta, who is also the leader of opposition in Delhi Vidhan Sabha, said in a lighter vein that the party could have used a better picture on the hoardings.